With little fanfare, the first available devices running Nvidia's Tegra 4 ARM chip have popped up at Best Buy and Amazon. The Toshiba Excite Write and Pro tablets are 10.1-inch slates based on Tegra 4, whereas the Pure is another Tegra 3 device. All three new slates appear to be available for purchase right now. 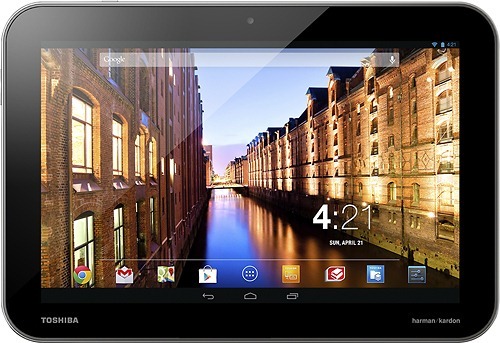 The Tegra 3-based Pure tablet is a midrange affair with a 1280x800 resolution 10.1-inch screen. It comes with 16GB of storage and 1GB of RAM. The specs are okay when you considering the asking price of $299.99 ($266.42 at Amazon). The real headliners of Toshiba's surprise tablets are the Pro and Write. Both these devices bump the screen resolution to 2560x1600. They come with 32GB of storage and 2GB of RAM. Of course, inside is that brand new Tegra 4 chip – the first devices you can buy with Nvidia's new baby. The only difference between these two devices is the active digitizer support on the Write. Well, and the price. The Pro is $499.99 and the Write is $599.99. These are expensive devices, but at least Toshiba can claim to be the first to market with Tegra 4. We've reached out to Nvidia for comment. It's possible these devices were not supposed to go on sale yet. Note that Amazon shows the Write as shipping in 1-2 months, but that may be updated later today.